To view all the available rewards, sign in or create an account at www.parkcommunitypoints.com and select a Reward. Shop online through test.parkcommunitypoints.com and earn cash back for your purchases. More than 100 popular online shopping sites participate. Earn as much as 3.5% cash back from online merchants like Walmart®, Best Buy®, Office Depot® and more! Cash back amounts vary by retailer. If you have a Gold or Platinum Debit Card, sign in to your account at www.parkcommunitypoints.com and click "Shop Online" and "Shop Online Settings". If you have a Gold or Platinum Debit Card, sign in to your account at www.parkcommunitypoints.com and click "My Area Deals". With the My RewardsTM Gold Debit Card, you'll earn bonus rewards points when you shop online through test.parkcommunitypoints.com. With more than 100 popular online shopping sites, earning bonus points has never been easier. If you did all of your shopping online, imagine how close you could be to an iPod®, a plasma TV, a Caribbean Cruise, or even a new car! Bonus points amounts vary by retailer. If you have a Gold or Platinum Debit Card, sign in to your account at www.parkcommunitypoints.com and click "Shop Online". Pharmacy and Member Help Desk: 888-494-9503. If you have a Gold or Platinum Debit Card, sign in to your account at www.parkcommunitypoints.com and click "My Rewards Card" and "Rx Savings." To request assistance, please call 888-494-9503. Enjoy savings on rental car use & hotel accommodations on widely-used, recognized brands across the country. 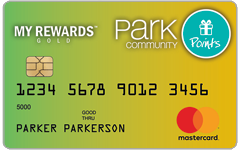 If you have a Gold Debit Card, sign in to your account at www.parkcommunitypoints.com and click "My Rewards Card" and "Hotel/Car Discount Codes". To view all the available rewards, sign in or create an account at www.parkcommunitypoints.com and click "Rewards". If you have a Gold or Platinum Debit Card, sign in to your account at www.parkcommunitypoints.com and click "My Rewards Card" and "My Area Deals". Shop online through test.parkcommunitypoints.com and earn cash back for your purchases. More than 100 popular online shopping sites participate. Earn as much as 5% cash back from online merchants like Walmart®, Best Buy®, Office Depot® and more! Cash back amounts vary by retailer. With the My RewardsTM Platinum Debit Card, you'll earn DOUBLE rewards points when you shop online through test.parkcommunitypoints.com. With more than 100 popular online shopping sites, earning bonus points has never been easier. If you did all of your shopping online, imagine how close you could be to an iPod®, a plasma TV, a Caribbean Cruise, or even a new car! Bonus points amounts vary by retailer. The My RewardsTM Platinum Debit Card provides you with an extended warranty for eligible purchases (up to $10,000). This warranty extends the original U.S. manufacturer warranty and any purchased warranty up to a maximum of 12 months. 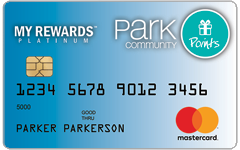 If you have a Platinum Debit Card, sign in to your account at www.parkcommunitypoints.com and click "My Rewards Card" and "Hotel/Car Discount Codes". If you have a Gold or Platinum Debit Card, sign in to your account at www.parkcommunitypoints.com and click "Rewards". If you already have a www.parkcommunitypoints.com account, please sign in and select Card Settings from the My Rewards Card menu.